For the last year or more, I've been running a 3D cube array of Auratone 5C cubes with four EV DL15W subwoofers for monitoring my Ambisonic mixes. I'm currently running the Blue Ripple Sound (http://www.blueripplesound.com/) third order cube decoder with very good results and am testing a few other decoders including the ones in the IEM Plugin Suite (https://plugins.iem.at/) which are coming along very nicely and are free. As the thread title suggests, I'm looking for a custom speaker array Ambisonic decoder to use in REAPER on Windows 10. I'm setting up a speaker array using 12 channels (11 full range and a sub) with a convention 5.1 array at head height (for compatibility with non Ambisonic mixing and listening), two upper front channels (above the main front L & R), two lower front channels (below the main front L & R) and two upper rear channels (above the main rear L & R). So basically a double cube without the lower two rear channels. The Blue Ripple Sound Rapture3D looks like it would be ideal but it is VERY expensive given the Aussie dollar to British pound conversion rates. The Gerzonic DecoPro http://www.gerzonic.net/ looks ideal too but there's no demo download (or any download for that matter) and I'm getting no response to emails I've sent. I've seen a few utilities that also seem perfect but they are Mac only. I have Bruce Wiggins vsts and the Ambisonic toolkit for REAPER (which are both very good) but the most I can do there is cube or hexagonal arrays in 3D format. I've considered the cube layout but the problem there is my main mixing array is a conventional 5.1 layout at head height. 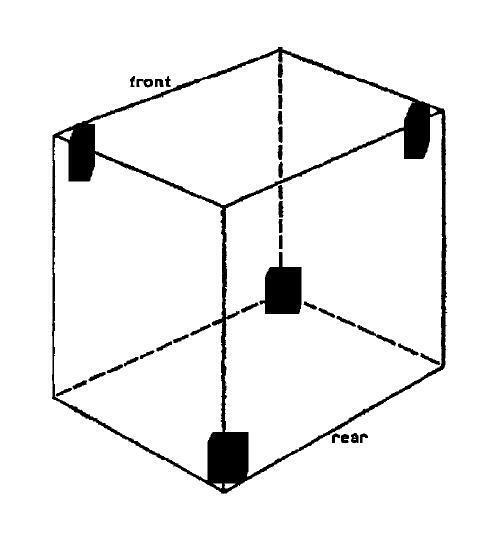 If that was to form part of the cube, it would place my listening position at either the base of the cube or the top of the cube (depending whether or not the additional speakers were above or below the 5.1 array) rather than in the middle. Does anyone know of anything I might have missed that would allow me to configure a custom speaker array? Last edited by ReaDave; 08-09-2018 at 02:23 PM. Upon rethinking all this, I might just go with setting up a 3D cube with eight speakers (Auratone 5Cs) and forsaking the traditional 5.1 mixing arrangement. It turns out I can probably emulate the 5.1 arrangement with some Ambisonic decoding already in my plugin arsenal. I'm quite probably going to be doing the vast majority of my mixing in Ambisonic format from now on anyway and that can be easily downmixed to other formats. That's exactly the line of thought I've followed. I started looking for a sub, even considered building one myself. Then I decided 5.1 wasn't the way to go. So I scrapped center and sub. The reasoning is that all real "mixing" will be done on four speakers anyway, as the center should only do voice and the sub would be fed a low passed sum in the end. That's when I decided for 8 identical speakers. I only have 6. They seem to have to be identical. And I took that down to four speakers, because my recordings won't have height information as I only start out. I hope I'll find 2 additional speakers while I'm starting to learn how to do 4 channels. And I hope adding the extra 4 channels later will be relatively simple. - panning out of the box between front and rear. No mixers seem to have this, so I'll have to mod a mixer, or stay ITB. - later on, panning height info, is more or less the same problem, but with 8 channels in stead of four. And that's a hardware problem, as I can find stereo pots to pan between front and rear, but 4 channel ganged faders are rare and expensive. And as I need two of those per channel for four channels, that's doable. With 8 channels, I'd need three four channel ganged pots per channel. That's going out of budget fast, with a total of 24 pots. I've temporarily scrapped the idea of buying a mixer to mod. Think I'll either be building my own one. Something like an 8 by 8 matrix mixer. Shure made one years ago, for line levels. But it's a rare beast. I only stumbled upon one for sale here by accident. It's too expensive for what it is (it isn't exactly high end soundwise) and it only controls levels, no eq fi. Anyhow, the four channel setup works. As a prototype that is. I still have to review the speakers, as they aren't as identical as I would like. Have to figure out if it's the room acoustics, or the speakers. ATM, I'm thinking about mic setup and mic building for a tetra mic, or one of the other setups. Ambisonic panning outside the box using non DSP techniques sounds like a lot of work and I'm not sure how you'd go encoding the Ambisonic information using that technique. What if you did the panning inside REAPER, post encoding and used MIDI controllers to control the Ambisonic panning plugins? I'm currently rearranging my speakers into a 3D cube which is a lot easier said than done!! I have seven Auratone 5C cubes and four other small two way speakers at present. Ideally, I'd like another 5C but for the initial experiments, I'm going to see if it is adequate enough to try to EQ two of the other speakers to match the 5Cs as far as possible. I could see phase issues being a potential problem though. I did some initial testing with the cube arrangement VERY loosely arranged with four of the speakers on the floor and the other four at head height and none aligned very well symmetrically. Probably needless to say but the initial listening tests, while interesting, were far from convincing as far as spacial cues go. This next test will be with all speakers equidistant from the listening position and with the two unmatched ones EQd as closely as possible. Hopefully that will yield substantially more convincing results. It's simple analog level panning, but in 2D (to start with) and later on in 3D. No DSP needed, imho. I'm planning to use it for mixing in mono sources and for level control while playing back in other rooms than my own. That's what I plan on doing. The mixer would only be an add-on and only needed for playback in other places. Speakers and mics need to be as identical as possible. On the mic side, this is less of a problem, as the mics are very close to one another. As long as the capsules are identical, you're good to go. On the speaker side, the room influence is a major problem. I haven't tried eq. I'm a bit skeptical about eq, as it doesn't do anything for reflections and I suspect it will even amplify reflections. I think you need to set the upper four higher. In all my limited testing with 8 speakers, I've put the top ones close to the ceiling and the bottom ones on the floor. And that immediately revealed problem #1: the floor is tiled, the ceiling is wood and hollow. Acoustically very different. That's why I went back to 2D with four speakers, for the time being. I need to make that work first and find another pair of identical speakers. I think it won't work with different speakers. At least, it didn't work for me, with 6 fairly identical active 2 way speakers and 2 active 3 way speakers. Same brand, same age, but the difference in mids was killing almost all placement info. Yes, please, keep us informed. And thanks for this thread! Well, that's MAJORLY annoying!!!! I just typed a rather long and detailed reply and accidentally hit the back button and lost the whole lot!! GRRRRR... Hate that!! Hmm... still not sure how you're working the Ambisonic encoding. From what I've seen through experimentation so far, to pan a sound in an Ambisonic mix, the source (mono, stereo or other) needs to first be converted to B format and then manipulated with a B format panning/rotating/zooming/other plugin. Keen to hear about your MIDI controller experiments when you get into it. Are you renting where you are now or is it your own property? Maybe you could look at double glazing although that could get expensive for a large area. No problemo!! Great to have your input here. I'm actually sitting at my DAW PC, typing this reply (for the second time!!) on it while REAPER plays some B format recordings in the background on the new speaker layout and I'm thoroughly enjoying it this time!! I ended up moving the lower ring of speakers off the floor and also moved the top ring up higher. My ear height is now right smack in the middle of the two layers. I also have all eight speakers equidistant from the listening position and have EQd the two non Auratones to match the Auratones as closely as I can. I did have to swap the polarity on them but that could be more of a signal routing issue because they are running from a different amp to the six Auratones. The non Auratones are serving as the lower, rear pair. Overall, the sound is FAR, FAR more convincing now and almost uncanny in 3D positioning. I had to pause a couple of times just to check that some of the things I was hearing were on the recording and not outside! I currently have three new Auratones and four original 80s models and have them very closely matched with a little EQ. Even so, I'm contemplating either purchasing one more new one to have four new ones in one ring and four 80s ones in the other ring or purchasing FIVE new ones to have a complete set of eight perfectly matching ones. The latter option is stretching my already far stretched budget though!! I just set up a large solar/battery/multi inverter power system for my home and studio (no more electricity bills!!) and have also just purchased two new Roland JP08 Boutique synths so the bank account has taken a pretty hefty beating! I am putting together some plans (in my head as I type!) to build a double octagon frame to mount all eight speaker to. At the moment, two are sitting on cardboard boxes, four are on tall CD racks (at the top and bottom) and two are on some Gibraltar drum hardware from my Roland V Drums kit. Quite the mashup!! Sounds great though!! It looks like my 5.1 (and 7.1) monitoring and listening options are all covered with the Ambisonic cube array too. I've just set up a project template with a Waves UM226 5.1 upmixer, an ATK 5 channel to B format encoder and the B format to 3D cube decoder and the 5.1 positioning is extremely convincing. But he's now running a Cube, just for one plugin that was an app in OS9 days (the newest is some sort of VST shop in the cloud) and a G5 for mixing with an RME PCIe setup. Never seen a cleaner computer... Even the optical drive is 100% functional after 10 years. There's just one of the two FW400 ports that doesn't like audio. It works with a harddisk, but not with the RME. Strange. The mixer I was eyeballing, was an old Yamaha 842. Cheap, I liked the looks and the layout and was thinking of modding the electronics. But I was too slow, it's gone. And I've scrapped the idea. I'm currently looking into a Korg 168RC. That could be used over Midi as a control surface and it has a double ADAT connection. I've only just found the schematics this morning and I'm going over them as we speak. It's also cheap, but not moddable at all. Luckily, there's almost no analog circuitry in there. Only 4 preamps, only 2 of those on XLR's with phantom power. But it's got 16 digital busses. I've just got to figure out if you can "translate" a cubase midi map (.amxd or .mix) to a Reaper readable format. If not, it'll be DIY. Unfortunately, it's tiled on the inside and if I rip out the tiles, there's only cork isolation left. So that's a plan for later. I've been playing iTunes 6 on the G5. Led Zeppelin, Pink Floyd, T-bone Burnett... And they all sound better than with the latest itunes. Go figure. Of course, stereo only for now. I'm designing four high speaker standards. But it'll be DIY, as nothing pre-made fits the bill. And that's the designer's bill, as well as the budget bill. Why don't you do 4 DIY Auratones? I mean, there isn't much special in there. The original Auratone manufacturer wasn't even a loudspeaker builder, but a carpenter. Can't be hard to match? I'm also considering hanging the top ones from the ceiling. But I'm taking it very slow. Heat, budget and the G5 first. You can try http://www.tslproducts.com/surroundz...ware-download/ FREE , can decode up to 7.1, and for thr top layer, put in a 2nd copy & point it upwards. In terms of speaker arrangements, I suggest at least 6 in a hexagon for the ELL. Most importantly, You want a very solid ELL before you expand upwards, for music mixing. You can do less for the top layer. 6hex also covers ITU 5.1/7.1 better than 4.0 square. I'm more of a surround dude, and I mix in 5.1/7.1 mainly, although I have gone higher & am using a bit of 1oA in my mixes. NB: I have 4 speakers in a rectangle, but a lot of meters. Last edited by junh1024; 03-24-2017 at 05:08 PM. I'm a big fan of SoundField. I'd really love to have the budget for a SoundField ST450 II Mic but that amounts to almost $10K in Australian dollars. 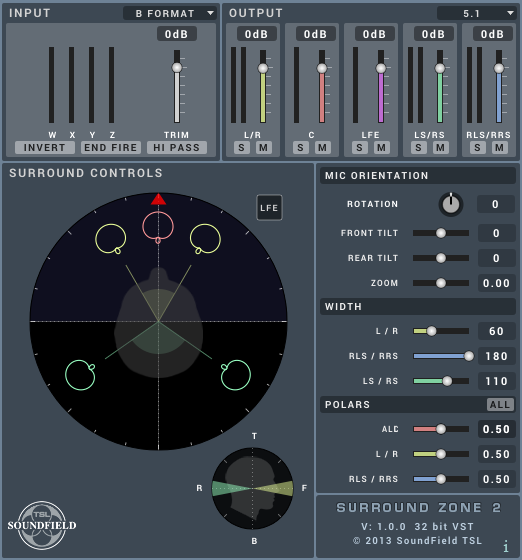 The good news though is that Rode Microphones recently purchased SoundField and they are working on a SoundField VideoMic which should be much more within my budget when they release it. I'm a big fan of Rode mics. I have two NT2a LDCs and they are real workhorses with VERY low self noise and great sound. Rode are an Australian company too. Funny you mention that. I've been happy with these upmixers for general purpose work in the past but I'm becoming more critical of the front image lately. I made a REAPER track template that uses a couple of instances of 226 for the rear channels and Blue Ripple Upmixers for the front image and it is much nicer. Do you have any recommendations for other 5.1/7.1 upmixers? Since first creating this thread, I've actually invested a fair amount in Blue Ripple products and have been doing all my work in third order Ambisonics. I have their Upmixers and Decoders as well as the Core package and am pretty happy with how the Auratone 5C cube array works with it all. For upmixing 2>5.1, I would reccomend DTS Neural upmix (ORIGINAL edition, NOT the waves edition, waves has a bug with LFE). DTS Neural upmix (ORIGINAL edition) gives the most discrete channel content (if you're not upscaling dialogue, set width 100% to get 4ch out). NOTHING ELSE. Everything else VST ive tried nugen , soundfield , Surcode, SRS, waves um, arctan, spat, everything passive all falls short in one way or another. I would not reccomend upmixing 2>71, but DTSnu can do so aswel. I havce not tried iosono, blueripple/harpex, or penteo. Thanks heaps for the recommendation. I did a search for the original DTS edition but it appears they are working exclusively through Waves these days. What is the LFE bug with the Waves version? Blue Ripple don't do a stereo to 5.1 upmixer. Their upmixers are to upmix a given format to third order Ambisonics and place it in the Ambisonic space. Workaround: downmix LFE into L R @ -3dB. -Waves has LFE at incorrect level. Workaround: gain LFE by -10dB. - Waves has less discreteness than original edition due to FFT averaging. 2.0 to 5.0 Upmix (M).txt or 2.0 to 4.0 Upmix (M).txt in https://github.com/junh1024/Reaper-Surround . Then use 5.1 Mix Control (M).txt to get DTS controls. Use 2>5 on vocals ONLY. 2>4 on ambiences etc. Maaaaaaaaaaaybe on full mixes if you're desparate. Then use pseudostereo on the rears to get some width, and maybe add some delay&/reverb on the rears. I will send you a PM shortly. Last edited by junh1024; 03-27-2017 at 10:38 PM. But how do you use these? These are JSFX so just Put them in your EFFECTS folder. As the desc says , Mix Control is "Useful after upscalers that don't have these controls." And it only works with DTS Neural upmix? Or are there any other plugins that work with these JSFX scripts? Got your PM. Haven't had a chance to try your JSFX yet but I will do. The next three days are going to be pretty hectic here so I might not get time to dig in until the weekend. Do you know if it is still possible to purchase the original edition of the DTS upmixer anywhere? Perhaps even from someone who doesn't use it any longer and wants to sell their license? The discreetness (especially genuine discreet info in the rears) is what I am after most. See if my cheap JSFX is enough. waves only loses 1~ db of discreteness so you prolly can't tell unless you listen closely. But thenagain, ceveats above. BTW what kinda materials are you upscaling?, and for what purpose? Do you have any other upscalers apart from waves? I'll see if I can discuss some alternative solutions perhaps via PM. Last edited by junh1024; 03-31-2017 at 01:27 PM. And I've blown pair #3, so 3D sound will have to wait. I should probably rewrite the upscalers to have native depth code that sounds nicer sometime. (but it probably won't ssound very goot. Last edited by junh1024; 03-31-2017 at 07:00 PM. The main reason is, you'd have to design the one multi channel speaker with the room it would work in. And it would need to be in the center of the room. The rest is some of Bose's "Direct Reflecting" system. We all know how that sounds. I've tried a few different ones over the years including the Nugen one you mentioned (I wasn't impressed with it either). I've also created a few matrix decode templates in REAPER which work for ambient stuff but aren't very good for discreet requirements. * Listening to stereo music in surround via Ambisonic cube array. My typical approach to upmixing and monitoring on my cube array is to upmix stereo to 5.1 using Waves then pass the Waves output to a Blue Ripple upmixer (giving me a third order Ambisonic output) and pass that to the Blue Ripple cube decoder and into the speaker array. Given what you've stated about the Waves DTS upmixer, it may well be perfectly adequate for my purposes. It will have to wait for now though. With the Aussie dollar the way it is, that Waves suite is quite an outlay and I have other priorities such as studio PC upgrades that come first. I'll see if I can discuss some alternative solutions perhaps via PM. I'm definitely up for that. My surround upscalers are basically matrix decoders. Use waves, any upmixeer, or see below. Try this https://hydrogenaud.io/index.php/topic,52235.0.html for foobar2000. If you want to use this to upscale stereo to surround for productions, you can do that too. (use the old defaults preset to get DTS defaults) NB: Most stereo does not sound goot when upscaled to surround. I will send you a PM soon. There should also be another one from earlier this month. Last edited by junh1024; 04-16-2017 at 04:34 AM. Thanks heaps J for those suggestions. I've downloaded the Foobar plugins and will give those a try. For most other situations where I want to upmix stereo to HOA, I've come up with an FX chain using a variety of plugins that does quite a good job pulling the image completely around the listener. There's a NuGen 3D upmix plugin that I'm interested in demo'ing but I don't want to try it until I have the funds available in case I really like it!!! I haven't been that impressed by their past offerings but some reviewers claim this is in a totally different class quality wise. Perhaps it is... Perhaps not. I have to say though that overall, my need for such elaborate upmixing is becoming less and less. I'm pretty much working with my own original compositions these days so my projects are mostly mono, stereo and multi channel sources placed in the 3D field with the Ambisonic tools I already have. * 4.0 (padded to 5.1) & 1oA 3D cube. These are CORRECT. * 1oA 11.1bf decoder.txt. This actually fits your setup perfectly, but it's WRONG. To compensaye, raise back by a few dBs. RE NuGen 3D upmix plugin, You don't upmix surround to ambisonics. You PAN surround to ambisonics. If you upmix, you're destroying directionality. If you want to destroying directionality, use ambifreeverb instead. BTW, where can I hear your compositions in ambisonics? Thanks for the info on your updates. I'm currently doing everything in third order using mainly Blue Ripple plugins and their cube decoder is actually very good. As for my reference to upmixing, I'm speaking of actually upmixing a stereo source to full third order Ambisonics which is what the NuGen upmixer does with a stereo source. It creates width, depth and height from a stereo source. I haven't tried it yet but I am curious. Regarding 5.1 to Ambisonics, the Blue Ripple upmixers can do either panned 5.1 to Ambisonics or implied upmixing. The latter takes the 5.1 information and creates a continuous circular image rather than just point source locations for each of the five channels. It really is a considerable improvement over simple point source panning. The Blue Ripple upmixers and decoders cost me a fair amount of money but they really are the best tools I have yet found. I have to say though that the IEM guys are catching up and their latest panning and manipulating tools are on par with Blue Ripple. I only have one Ambisonic mix available on my website at this stage but the new double length album I am currently working on will be there as well as a third order download. Just bookmarked this and will download and check out some of your work over the next few days. Some very interesting looking stuff in here. 1. Thanks. Any comments? ambisonics stuff is nothing special, but surround manipulators & 3D workflow i believe is unique. 2. Have a look at the ambix suite http://www.matthiaskronlachner.com/?p=2015 , particularly ambix_widening. I beleive it does 2D delay-frequency widening. If you want to really ruin directionality to 3D without using ambifreeverb(2), you can put ambix_widening on, rotate it, and put another on. It really works, play with settings. Tip: use o3a flare to monitor what you're doing. 3A I'll have a proper listen to RTR when I've finished preparing my decoders for my own speakers. I suggest you also keep the RTR fuma link on your site too, and a long note may not be necessary since people that know ambisonics should know the difference. I also managed to find ultrasound on your GDrive. Is that ambix? Both mixes feature (very) aggressive 3D placement, and placement of things direct/side left, and RTR has a slight focal at the bottom, these may not be a good things, again, i'll revise my feedback once I've had a proper listen. I've just been mainly looking at the image on O3A flare. 3B Based on a combination of listening & Flare, here are Some tips I made after I finished listening to RTR & US. - Use PMOD for a quick way to add movement (eg., 16th arp in RTR). Move both A & E.
- Instead of regular delay, dry in stays front, route the wet part of the delay to the rear, and then pan that to the rear. Spatial delay is now available (free O3A). May or may not do the same thing. - Sounds at directly above & below will be played through all speakers in 2D = sounds bad (some synths (RTR) & piano (US)). - Side is not a good place to place instruments since human hearing is most insensitive there. RTR reminds me a lot of Jarre & Lichtmond stuff due to the retro 70s/80s synths. I'm glad US sounds a bit more modern, like 90s-00s. RTR in general sounds like stereo panned to surround with the occasional directional sound. I had to use my own speaker correction tool to move everything side to front since ambix_warp crashes. That's how bad the directionality is. Ultrasonic is slightly better, but sometimes the placement of sounds seems a little weird & I can't help but think it's due to your speaker arrangement & decoder. I personally find mixing in Ambisonics and decoding to discreet surround provides a better mix than discreet mixing precisely because it works with a sound field rather than isolated speakers. 4 Conclusion: mixing in ambisonics does not magically make the mix better. It depends per-mix, as my comments have shown. Ambisonics is also not detriment free. I've replied to that thread, but to summarize, Ambisonics can blind you from IRL speaker effects which basic decoders will not fix, surrounds are overloaded with ITU 5.1 decoding, making Decoders for arbitrary & irregular 3D arrays is non trivial, detecting & solving (subtle) ambisonics problems can be tricky, and you can never have a truly discrete center with 3oa since the resolution is 45*, but 5.1 LCR is 30*. I'm working solidly on my next album at the moment which is the biggest personal project I've undertaken to date. It is all being recorded and mixed in third order Ambisonics and I will be making it freely available in full Ambisonic format, 5.1 decode from the Ambisonic mix and regular stereo also decoded from the Ambi mix. 5 I downloaded FLACs of Jerusalem & Ghost Train. They were 44k. No problem. To my surprise, the AC3 is also 44k. This is a potential problem since if you're delivering for DVD/BD/TV , they are expecting 48k for AC3, and some hardware may have problems with 44k AC3. This may or may not be irrelevant/intresting to you. I am assuming you will also need 44k output for CD. You will need to decide for yourself at which point in the workflow to have 48k, or not at all. "12 channels (11 full range and a sub) with a convention 5.1 array at head height , two upper front channels (above the main front L & R), two lower front channels (below the main front L & R) and two upper rear channels (above the main rear L & R). So basically a double cube without the lower two rear channels. " 6 DO YOU still have this 11.1bf setup? I may be able to figure out a better solution than simply a cube. EDIT/PS: Can you please PM me your email? Might be more reliable tham PMs/forums. Last edited by junh1024; 07-27-2018 at 04:10 PM. Appreciate you taking the time to post your feedback and suggestions. I'm not online on my pc that often these days and am replying here using my phone so won't reply in detail with multi quotes because it is rather cumbersome. Regarding Ultrasound, that was a very early experimental section of one part of that tune where I was experimenting with various encoders. It wasn't supposed to be public and I've now removed it. It's a good thing you found it so I was aware it was publicly visible. Regarding Run the Race, it sounds to me like you are using a decoder that isn't decoding AmbiX SN3D correctly. The main focus of that mix does have the prominent parts placed in the front. I also created a stereo file from that mix using the Blue Ripple decoders and it sounds exactly how intended. I always test my mixes on multiple systems. You raise a good point regarding the AC3 files. I really should resample to 48K for those before encoding. Thanks for The thumbs up on that. Daniel, I've actually been running a few tests using both your upmixers/panners and the new decoding tools and am liking the new updates very much. I have done some direct comparisons between your tools and the Blue Ripple ones and the panners and upmixers are pretty much neck and neck quality wise. Very nice indeed. There's still something not quote as spacious with your decoders though. The Blue Ripple cube decoder has more width/height/depth. I have a project with both decoders and can provide you with a decoded cube array eight channel file to have a listen if you'd like. I'm definitely liking the direction you are heading with the latest versions of your plugins though. They have improved dramatically since the early versions in stability, CPU use and sound quality. In my post, my points are numbered so you can reference then when you reply without quoting. Regarding Run the Race, it sounds to me like you are using a decoder that isn't decoding AmbiX SN3D correctly. The main focus of that mix does have the prominent parts placed in the front. I am aware of ambix & I did convert as needed. While there is stuff at the front, there is also a secondary prominent synth which should be moved to front, or softened & placed at back. 7 I haven't listened to IEM ALLRAD, but it might be something as simple as reducing W by 10-30% to maxre levels (while still keeping things not out of-phase), or maybe some gentle EQing a la brauer effect. Last edited by junh1024; 08-09-2018 at 08:05 PM. Missed that with the numbering. Will respond in more detail later. I'm listening to Run the Race now and it sounds well balanced and exactly as intended here through the Blue Ripple cube decoder on my cube array. The stereo mix derived from this also sounds balanced and as intended here. What are you using for decoding and monitoring? I have experimented with reducing the W channel when using the IEM decoders but nothing I do here matches the Blue Ripple decoder. The latest IEM decoders are far better than the previous ones though.